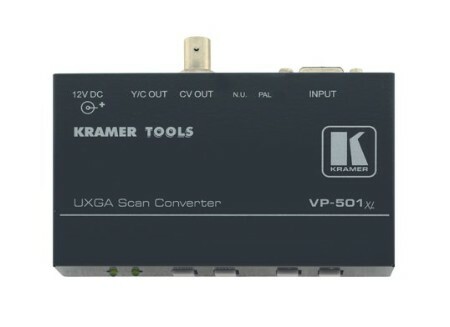 The VP-501XL is a scan converter for computer graphics video signals. It converts computer graphics video signals up to UXGA (1600 x 1200) to composite and s-Video (Y/C) signals simultaneously in either PAL or NTSC formats. Input Compatibility - up to 1600 X 1200. Auto Set Up Technology - One button auto setup that automatically sizes, shifts, and centers any input image on the display device. Proc-Amp - Color, hue, sharpness, contrast, and brightness controls. Multi-Format Output - Composite video and s-Video (Y/C) simultaneously. Compact Kramer TOOLS™ - 3 units can be rack mounted side-by-side in a 1U rack space with the optional RK-3T rack. INPUT: 1 x VGA/SVGA/XGA/UXGA on an 15-Pin HD F connector. OUTPUTS: 1 composite video 1Vpp/75Ω on a BNC connector. 1 Y/C (s-Video) 1Vpp/75Ω (Y), 0.3Vpp/75Ω (C) on a 4p connector. OUTPUT STANDARDS: PAL, NTSC (user-selectable). CONTROLS: Front panel and OSD: ProcAmp video controls, Freeze, Underscan/Overscan, Auto-image, 8 color bars. OPTIONS: 19” rack adapters RK-T1, RK-T3.